THE BEST MHDH APP EVER! This FREE edition is with Ad. On the other hand, the Deluxe(PAID) edition will NOT have Ad. MHDH is finally here! This app is to be used as an assistant while in game to help you get more out of your MHDH gameplay and have the knowledge of those professional gamers! 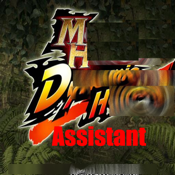 Why don't you try MHDH Assistant? WHAT IS THE BEST WAY TO USE MHDH ASSISTANT? 1. Have your Iphone/Ipod nearby as you play MHDH, to check and update your strategy as needed in game. 2. When you can't play MHDH, use the app to check your strategies and improve your knowledge of the MHDH universe! 3. Share this app with your team members, and further improve your team skill! 3. More Game secrets and tool tips. REALIZE YOUR TRUE POTENTIONAL TO DEFEAT YOUR MONSTERS AND BECOME PRO AT MHDH!